The MACC Fund, Midwest Athletes Against Childhood Cancer, Inc., was founded during a Milwaukee Bucks game on Dec. 10, 1976 when the Bucks retired the Number 14 of the “Original Buck,” Jon McGlocklin. McGlocklin and his good friend and iconic Bucks radio announcer, Eddie Doucette, founded the MACC Fund to raise money for research to help children like Doucette’s toddler son, Brett, who was battling leukemia. The younger Doucette, considered the MACC Fund’s first “success story,” is married and living with his family in California. From those humble hardwood beginnings, the MACC Fund has grown to be a major contributor to research for children’s cancer and blood disorders in Wisconsin impacting the treatment of children throughout the state, the nation and the world. Overall cure rates have risen from 20% to 80% during this time with the MACC Fund helping with that growth yet children still relapse and have “late effect” issues which require more research. MACC Fund support to the Medical College of Wisconsin with research in the 6-story MACC Fund Research Center, the MACC Fund Center at Children’s Hospital of Wisconsin and the UW Carbone Cancer Center in the MACC Fund Childhood Cancer Research Wing has made a difference in the fight against childhood cancer and blood disorders. 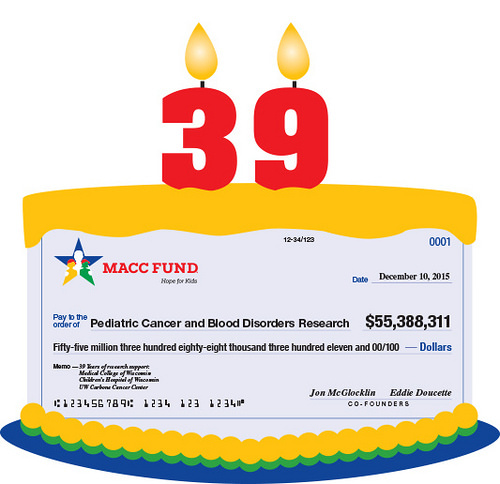 The MACC Fund will celebrate its 39th Birthday on Thursday, Dec. 10 by sending these institutions checks totaling $1,042,500. This brings the 39-year total of research support to $55,388,311.